Niamh Shields is a woman of many talents : not only is she an Irishwoman abroad, she loves eating, cooking and travelling, and writes eloquently about these on her blog Eat Like A Girl. She's also one of the few bloggers I know who didn't learn to cook at her mammy's apron strings (I didn't either, if you want the truth...) and I think this gives her an added edge as she had to start from scratch and use her instincts to discover what she liked. 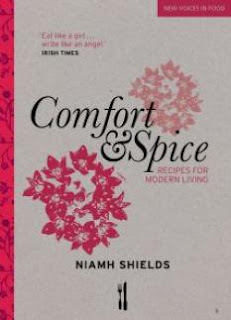 Naturally, the next step in Niamh's progression was to write a book, and so Comfort and Spice was born. I was really looking forward to reading this as I love how she writes about food - she genuinely enjoys cooking and bringing together ingredients that work beautifully together. She also hasn't forgotten her roots with recipes for Irish dishes like the unique Waterford Blaa, Spiced Beef and that special winter warmer, Hot Port. The book itself feels lovely to hold, with a flower printed binding and beautiful photography and illustrations to showcase the very straightforward and achievable recipes. I've already bookmarked the Pistachio Creme Brulee, Sumac Lamb Meatballs (without coriander...) and Ragu Empanadas as things I really must cook! If I'm feeling brave, I might just even try to make my own butter - well, I do use kilos of it when baking. Niamh has also just been crowned "Best Food Blogger" in the OFM Food 2011 Awards which is as prestigious as it gets. 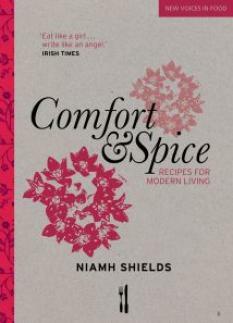 Comfort and Spice is published by Quadrille and is available in all good bookshops. What a wonderful name for a cookery book - I'm going to search it out.